What do you make, when you should have gone grocery shopping yesterday, and hubby says "whats to snack on?" Hmmmm, well, I did a quick check of what I had on hand and came up with this idea. The possibilities are endless; tuck in a few chopped mushrooms or pieces of broccoli, or if you aren't in the mood for pizza, fill them with cooked chicken and Alfredo sauce? This really isn't a "recipe" as much as it is an idea. 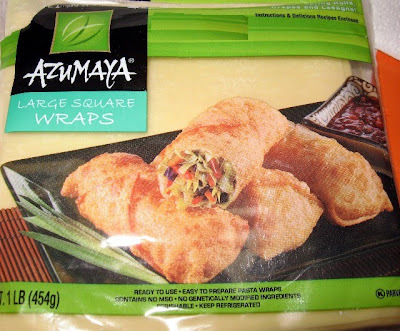 Make sure you buy the large egg roll wrappers (they are great to have on hand since they stay good in the fridge for a long time). 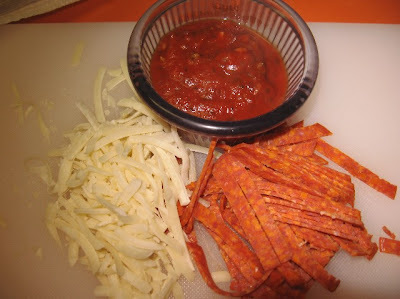 First, sliver the pepperoni and shred the cheese. If you use any other meat or veggie, make sure you cut it fairly small so that the cheese and sauce can melt around it (the filling will get hotter if you keep the ingredients on the small side as well). 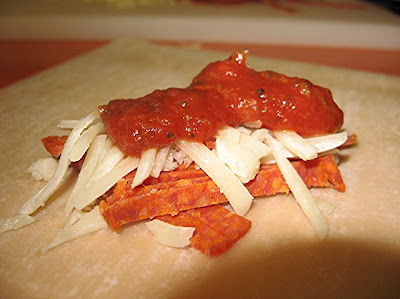 In one corner of the wrapper, stack meat first, then cheese and sauce on top, then fold the point of the corner over the filling and tuck in the sides of the wrapper and roll them up. When you are done rolling, you will come to the pointed corner of the wrapper. "Glue" the wrapper point onto the pizza roll with a slurry of flour and water (should be the consistency of Elmer's Glue). 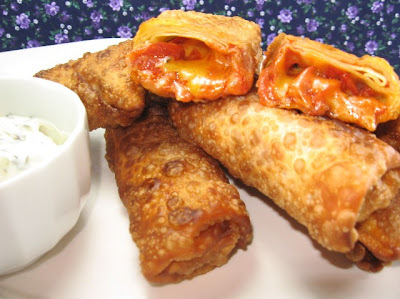 Fry these pizza rolls in canola oil at about 350 degrees. Watch the first few carefully since they brown very fast. If they seem to be browning too fast, turn the heat down a little. These are addictive, and we enjoyed them dipped in ranch dressing. NOTE: These can be assembled early in the day and refrigerated until it is time to cook them. OMG Coleen I'm making these!!! The kids will love them and so will hubby. I've always wanted to try to find a recipe for the frozen pizza snacks you get in the store, this is PERFECT!!! When my husband wants a snack he gets popcorn or crackers not something as fabulous as this! Tell him he's a lucky man! Wow my husband would flip his lid over this, can't wait to try it! These look delicious, Coleen. You are so good to your hubby! My neighbor is Thai and she makes homemade eggrolls all the time. I've never done them because I just eat hers. What a fun, creative snack idea! A couple of my kids were looking over my shoulder when I first saw this recipe in my reader and are already begging me to make some! nom nom nom. These look fantastic! Wow that is seriously a fantastic idea!!! bookmarking and making when I can find the wrappers!! Yum! May have to try some of these! Those are a great snack and and a wonderful idea. I'd like to have those wrappers on hand to try different fillings with them also. Those look so yummy!! What a great idea!! Thanks for sharing!! Oh, shoot Coleen that's a winner right there! I'm thinking that's the perfect after school snack for my crew! I can prepare thme the night before and the sitter can just fry them up! Thanks for sharing. I'm gonna try tracking down those larger wrappers. You are so clever. What an excellent snack. My family would devour these! I would love to make these! 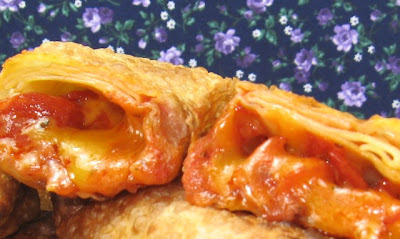 My son would go nuts - he loves pizza pockets and I don't buy them. Haven't seen those wrappers around here, but I will surely look for them. I tend to only see the eggroll and wonton ones here. What a great idea..the wraps are on my list! p.s. be sure to stop by and enter my contest! GREAT party idea, so cheesy! Coleen, these are positively BRILLIANT!! I cannot tell you how well received these would be here. I would be the Queen of the Universe while these lasted, grins. This is another great idea I just love. Thank you! OMG these look fantastic! I'll have to make them for my hubby. He'd love them!